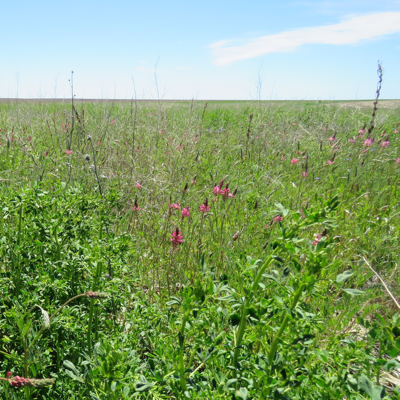 Earlier this year, conservation partners in Colorado received word that a new Continuous Conservation Reserve Program (CRP) SAFE practice for upland birds was approved, with 20,000 acres allocated for a nine-county area in the northeastern part of the state. Within six days of the program opening, all 20,000 acres were enrolled, with most people choosing the longer 15-year contract, plus more acres on the waiting list. Although it sounds like the Upland Bird SAFE was an easy sell, Strong said it wasn’t a fit for everyone. What makes this program a bit different from general CRP and other continuous practices is the high plant diversity cover requirements to create suitable habitat for upland birds—such as Ring-necked Pheasant, Northern Bobwhite, Greater Prairie-Chicken, and Grasshopper Sparrow—that need more open ground and forbs than is usually found in older CRP fields. According to Strong, many landowners are champing at the bit to get into these types of conservation programs because commodity prices are low right now and it doesn’t make financial sense to return these fields to crop production if an alternative is available. But it’s really a combination of things that get them interested enough to enroll. The Upland Bird SAFE is a multi-partner effort that began six years ago with a proposal to USDA Farm Services Agency. Biologists and staff from Colorado Parks and Wildlife, Pheasants Forever, and USDA Natural Resources Conservation Service were not only involved in developing the proposal, they were heavily involved in getting the contracts signed, doing field checks, and making sure the program met the goal of providing upland bird habitat. Farm Bill Biologists, like Strong, will continue to keep in touch with landowners and help with the field cover conversions. Habitat benefits for upland birds will begin in the first growing season after the cover plantings, many of which are planned for spring 2019.